New Zealand has been hit by a 6.0 magnitude earthquake off North Island, USGS reports, just hours after Japan suffered a 7.4 magnitude jolt and a series of aftershocks off the Fukushima coast which unleashed tsunami waves. 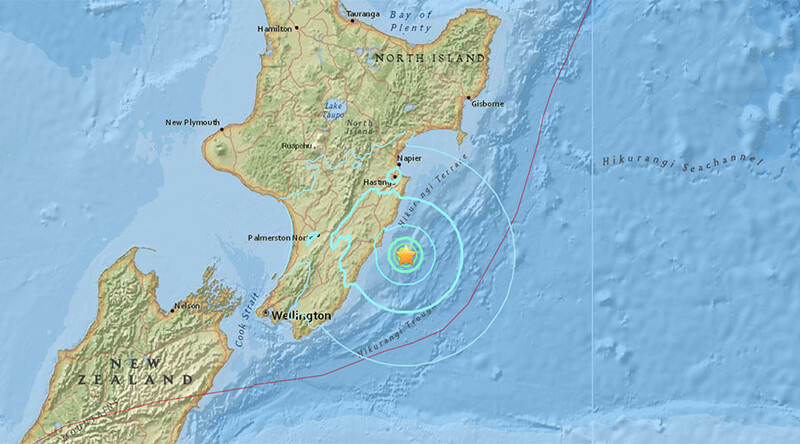 The earthquake, initially estimated at magnitude 6.3, was registered at a depth of 37km (23 miles) and centered off the coast of North Island, some 123km (76 miles) from Palmerston North. Tuesday’s quake comes amid a tsunami scare in Japan and just over a week after a powerful 7.8 magnitude earthquake struck South Island on November 14, also triggering a tsunami and a series of aftershocks which left at least two people dead. New Zealand is regularly hit by earthquakes because it sits in between the Indo-Australian and Pacific tectonic plates.